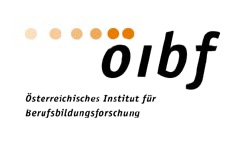 The Austrian Institute for Research on Vocational Training (Oeibf) is a non-university research institute. Oeibf's mission is to carry out high-quality research and development in order to support and promote activities and policies concerning vocational education and training (VET). In its work it focuses particularly on innovation in education and the interrelation of education and the labour market. Oeibf is active both on national and international level and delivers services for various organizations in Austria and Europe. Oeibf's services are considered as contribution to the solution of complex scientific problems with education multidisciplinary approaches, in the form of basic research and applied research and development. Its work is fully based on project-related funding which ensures its independence. Key research areas in which the Institute has built long-standing expertise are: professional skills development, quality and professionalism, as well as educational choice and participation. A further focus is innovation fields of vocational training in Austria which have been defined in cooperation with responsible agencies and conceptually designed. In recent years, oeibf was heavily involved in the development of an Austrian national qualifications framework. This included the development of several dimensions ranging from learning outcomes and quality assurance processes to valid approval procedures in various ways and for different sectors of the Austrian education system. Against the background of the differentiation of quality assurance and development and the methodological and procedural approaches which form the basis for this, the Institute has developed numerous findings and products related to educational organization research, paying particular attention to perspectives of learners as well as teachers as an important stakeholder quality discourse. These range from international comparative research, through process development, qualification of teachers and reviewers or auditors, to the certification of educational facilities. • Transition from school to in-company training. Projects range from qualitative and quantitative analysis, to system and impact analysis, monitoring and evaluation up to development of curricula, methods and measures in the field of VET. Particularly in the context of international projects (ERASMUS+, LLL, LdV, ESF) Öibf coordinated the development of models, manuals, guidelines and toolboxes as well as new measures such as peer reviews in VET. Öibf participates actively in the current scientific discourse on VET and VET research. Thus, it publishes regularly in specialised magazines, designs workshops for a broad spectrum of the professional public and organizes conferences. E.g., Öibf was the executing institution which designs and executes the Austrian Conference on VET Research, which is the largest of such Austrian conferences with more than 300 national and international participants every other year. Öibf has got multiple network connections on regional, national and European level which are an excellent base for dissemination activities. It participates in relevant associations and organisations (e.g. ÖFEB) as well as in development and steering committees (e.g. in the context of the National Qualifications Framework). It also has got well-established contacts to enterprises, representations of the interests of employees and employers as well as public institutions (e.g. Arbeiterkammer Wien, Federation of Trade Unions), educational institutions and authorities (including ministries). Cooperation with national and international research bodies ensures ongoing debates with other stakeholders in VET research. International projects (e.g. TrainCom: Developing Training Competence in IVET by Using Units of Learning Outcomes) are further platforms for dissemination.